Edit: Nov 30, 2007: All links in this post now refer to the latest version(s) while an updated screen shot and removal instructions can be found on this new post. When I try to install the add-in I get the message "The selected add-in failed to install. The error was CannotCopy. Please contact the add-in author for assistance"
Does that still happen after a WHS reboot (just in case)? For another quick sanity check... see if the add-in's msi file has the Read Only flag, if so remove it and try installing it again. If that doesn't help... Tell me about your WHS... home built? Prebuilt? If so, by who? First off, I don't know much about software or computers. However, I have an electronics background. I followed Brendan's instructions to the letter, loaded his add-in and everything seems to be working. I just built my WHS server using an Asus barebones server and then purchased WHS. The first thing I noticed with WHS is the software was missing the feature I really needed. I needed to have share folders on the server accessible via the web. The WHS server offered the valuable file back-up I was looking for but missed the mark regarding file sharing over the web, until now. I felt foolish for spending so much time building my box, buying WHS and then spending hours figuring out the software, only to find out WHS wouldn’t do the one thing I really needed. I searched the net for days, non stop. I mean non stop - at least 20 hours worth trying to find a solution. So...I find an application “WebDrive” and that looks like it could work but now I have to find some remote server to store my data (and I already had a server, WHS), so... WebDrive was not a great solution for me. Sorry for the rambling, I just want people to know Brendan's solution is a "killer add-in" and I think Brendan is a genius! In the next few days I will test out the application and report back. In closing, I’m an average end user and I was able to use Brendan’s add-in with no trouble loading or configuring. That’s a lot more than I can say about certain programs costing big bucks! How can I send Brendan a check? People need to be rewarded for their work. I really can't thank you enough for this thing - being able to get WebDAV working on my WHS (HP MediaSmart EX475) so easily really made my day. I removed the application (Web Folder 4 WHS,) but the folder still exists. How can I remove the folder? Did you just remove it through the add-ins page (Settings -> Add-ins) or did you first remove its configuration with the Remove button in it's settings page (Settings -> Web Folders). If just the first, reinstall it and then use the Remove button to remove it's configuration before removing the add-in itself. 0x800070780 the file cannot be accessed by the system.. I'm having some difficulty with the add in and wondered if you had any suggestions. I installed to program without difficulty but now in "Setup" see a green check next to every line except "DFS Root" where there is a little red x. The ?result is that when I go to the Web Folder tab at the top I never get to see the folders (to then share) despite lots of "refreshes". Thanks. Does the add-in add Webdav capability. As far as I can tell, Webdav access isn't include in the homeserver package. WebDav is included in the WHS box... it's just not installed or enabled. When you setup my add-in, WebDav and DFS (the two missing components I rely on) are installed, enabled and configured. I have this setup and works good....but...there is no security. Yes, it asks for a username and pass to login, but after that, if a user doesn't have access to a folder that has web enabled, they have access to it through Webfolders. Is there any way to change this? All security permissions are handled by the base WHS shares and not my add-in... and if you are seeing otherwise I'm a little worried. When a user connects to the root web folders share (http://server/WebFoldersShare) they do so with their Home Server account... and any account on ones WHS should be able to do so. When choosing a specific share that has been Web Enabled, it is up to the underlying share to decide if that user has permission. The best example of this is if you have two users A and B with the default permissions on their private home dirs... and then A logs into the web folders and tries to access B's share and will be denied. Are you not seeing this? What are you seeing instead? Feel free to email me so we can have a faster back and forth. Hi - tried very hard to get this to work but did not quite succeed. That was on a HP EX470 (mediasmart) box. I was trying to access from a Windows XP Pro laptop. I think that the key issue may have been that the userid I was trying to log on as is different from the one I am logged onto the laptop as. Secondly I also lost the HP webfront end whilst the addin was running (restored when I removed the addin). Would be nice to see it working though. I bought an HP MediaSmart Home Server several days ago after one of my sons suffered a head crash on his laptop and lost everything. Your add-in is the perfect addition to a product that has already exceeded my expectations as far as ease of installation, configuration and ongoing use. I can now access my folders remotely as easily as I can when connected to my network. A REALLY nice job. Thanx! First thanks Brendan for the great Addin. I have installed this Addin and it works great. Computers can map the directory through my computer fine, but I have had issues when a Mac User is trying to mount the webshare folder. I go through the mounting steps and at first pass the username and password are accepted, but towards the end of the mount attempt I get an incorrect User name or password error. Does anyone know the cause of this? Great Add-In, thanks. I can now easily access and drag-and-drop most files. This might be a limitation of WevDAV, but there are some file types that I cannot copy (such as .aspx, .vb). Any clues on how to enable more file types? I am using an older version of ACT! (ver 6) which will sync with a folder but not through a website - so installed your WebFolders4WHS and it seems to work the way it is described. I mapping a folder on a Vista computer and after creating this folder I checked to see in Explorer that it is correct. However, when I go to setup the sync folder for ACT! and browse to the mapped folder - it is actually a temporary folder. Any idea on why a temporary folder is created? I'm trying to reproduce this on a couple of Mac's currently. I suspect IIS/ASP.NET is blocking those files not unlike how it prevent serving of some of those files in a regular ASP.NET application. Really the way Windows accesses the configuration from my add-in remotely is by creating a virtual/temporary directory on the client that the shell redirects to the remote location... I’m forced to wonder if ACT is some how seeing past this illusion. Yes, I think ACT is seeing the temporary folder after I browse to the web folder created through your app. The real problem is that the database file is recreated in the temporary folder with a number after it to distinguish from the previous version and then it is not recognized as the same file by ACT and is not even opened because of the format of the version within brackets. Can you post the instructions in PDF or a lower word version? Thanks. Does the client computer need to be Windows? Reason I ask is I primarily work on a Mac with Firefox or Safari. Anon #2: In theory any machine capable of accessing a WebDav site over HTTPS should have no problem being a client to this add-in... I have not been able to test this with a Mac as yet however. Why does this "copy" the folder you want as accessible rather than just "point" to their current location?? gonna use up a lot of disk space if you have a lot you want access to! No copying involved, just the ordinary WHS shares and a few file system pointers... the disk space cost of this add-in is effectively nil. Note the https:// followed by the http://. in the Vista Map Network Drive window. When I do this Vista then pops open a dialog asking me to select a "certificate" but none are listed for me to select. Do you happen to know what I am doing wrong or what I need to do? So far everything shows up as expected using web folders remotly. When i try to open an actual file i keep getting the error "The filename, directory name, or volume label systax is incorrect". This is true for pdf or text files. Excel files open fine. Anyone been down this road before and can offer some insight? Thanks a bunch - now uploading entire folders and tree structures is a simple drag and drop - a breeze compared to the built in method. Accessing/downloading files via my smartphone also works (via ftp like interface) - prompts for credentials and voila - there it is - Now I can access my music library anywhere. Major Kudos - Should hold folks through until Power Pack comes out - which is also supposed to have similar functionality. Someone help me, not sure about this. It seems to work fine when creating a mapped network drive in Vista. However when i do it on an xp machine it comes up saying 'The folder you entered does not apear to be valid'. AMAZINGLY great addon. However, I'm having an issue. When I map the drive everything works fine, but it does not show up in my Windows Explorer. I have to access it through my Network places (and, accordingly, no drive letter is assigned). Joe: Sounds like you are running XP or 2003... this is a limitation of the Windows shell there where without third party software you can't map the drive with a letter as you can in Vista/2008. I followeded your installation guidance document to map a drive from Vista to the photos directory. While I successfully mapped the drive the drive doesn't show files or folders. I attempted to drag and drop a file into the folder but I get "an unexpected error is preventing the operation. 0x80070780: The file cannot be accessed by the system." An internet search indicated "that error is what you get when you access files from the data partition of the system drive out of a multi-drive WHS installation." FWIW, I have a four drive configuration. This appears to be the same issue as Gil (above) previously posted. to sync personal files amongst my 4computers & the WHS. Away from home, I'm stuck with the simple download/upload WHS options; no syncing of file deletions, etc is available. Will Web Folders 4 WHS give me the ability to run Second Copy while away from my home network? Thanks. Has anyone else noticed that users that do not have remote access credentials in WHS can get at the folders exposed through the add-in? 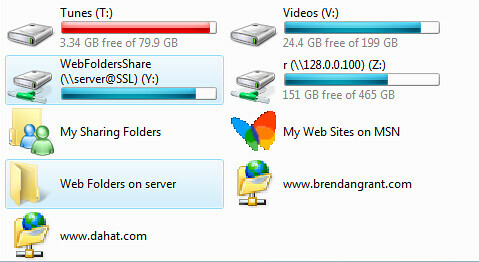 Brendan, I have installed your WebFolder add-in for the Home Server. 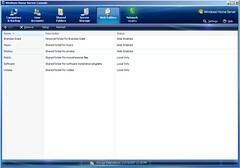 The intention was, to get 2 remote computers (Windows XP) sharing the same directory (e.g. Public) and have files be protected against changing them on the same time by the 2 users, in which case only the last saved changes are stored and the other changes are lost. So the server-directory has to be available local without dragging/dropping. As far as I understand WEBDAV, that should deliver me that protection. So I installed your add-in and created a webfolder and set the folder Public on Web-access. So far so good. Then I created a simple text file (test.txt) and tested the protection. Unfortunately no protection was present, so only the last change was saved. On the XP-machines I tried it with creating a network share (\\Server\webfolders4whsshare\Public), which gave me the contents of the directory but no protection. When I try to make the share available through the wizard Networklocation/-server, I get an icon with the servername but no directories on double-click. What am I doing wrong? Or do I want something that will never work? Just wanted to post a comment about how incredibly grateful I am to you for this add-in. It installed like a dream and (with a few hitches due to me not interpreting the instructions correctly) got up and running within 15 minutes. Wow. This was truly a blessing. Thanks for your efforts. I get a request for a certificate when I connect to my webfoldershare, but there are no available certificates in the dialog box. I can connect fine through a web browser, but not through the mapped drive in Vista. Great add-on! Works great for me and is extremely easy to setup. Thank you for your effort and allowing the rest of us access to it! Great app, but on my machine, I am unable to open .pdf and many other files directly from the WebShareFolder. The error message says file is not found. I have to copy the whole folder to my desktop, work on the documents, and then upload everything back to the websharefolder. Pretty aggravating. User error or WebShareFolder limitation? Otherwise, love the concept. Should be default with WHS. AMK, it is probably an issue with the WebDAV client built into the Windows shell which is trying to access the file... that or the client app is wanting to do things to the remote file system that WebDAV doesn't support. Sadly though there is little my add-in can do to fix such things. This add-in does exactily what I expected the WHS to do when I got the thing in the first place. Outstanding work. I'm getting stuck trying to configure the network drive. I can set it up to map through the www with http://??? ?.homeserver.com/WebFoldersShare; then it asks me from credentials and I give it; and it works. Then when I reboot the laptop I get an error - no DNS entry for \\??? ?.homeserver.com@SSL\blahblahblah and the mapped drive is a pile of broken. Not sure if it's my setup, but it's going way slower than my FTP setup. And for some reason I get an error code from windows that the file I'm trying to copy is bigger than the allowed size, so it can't save the file. 2) I would like to share folders not on the WHS box itself. How can this be accomplished? Right click on your server name, click "new link", add your info. This addon for my WHS is really great! Been using it on Windows platforms for about 4 months now and it's rock solid. I know the name of the blog is "I Hate Linux", and while I agree much of the time, sometimes I find myself in a KDE based system. No worries though because WebFolders4WHS to the rescue! It should ask then you to login and then all is right with the world. Add a bookmark for safe keeping :). I'm not sure what a Konqueror window is - but I was asked for similar information when setting up the shared drive in vista. Trouble is I reboot the machine and it forgets everything, and I have to go through the whole process again! Which completely defeats the purpose of this process being a setup up and smile convent system. I like to thank you for the great add-in for WHS. Before WHS I used a winXP pro as a webdav server, which I liked a lot because of the webdav functionality. So I missed the feature from day one in my WHS. I could have set it up the same way as on the WinXp box, but as warnings all over the place tell you; "Try to avoid doing stuff directly on the Win2003 OS itself as much as possible". As somebody else already asked. Where is the account/paypal etc. where we can sponsor you for the neet feature? As 2 people mentioned before, there is something wrong with the 'remote access' setting of whs and this webfolder plugin. I have 3 homecomputers(accounts) of which I don't want to setup a too difficult password. So I blocked these accounts for remote access. Then I created a few new accounts in whs with strong password that have only read access to all my shared folders. Now, with webfolders enabled on those shares the user accounts that I blocked for remote access(I can't logon to WHS through the webinterface with these accounts) have full acces to the shared folders. Even write and delete are granted! How do you open the istructions? They are in xml language. I had the same problem, if I recall right I changed the extension to .docx and word 2007 opened it fine. Excellent addition to WHS - as many others have already pointed out, something like this really should have been included with WHS. The default web interface (cut down version of sharepoint?) is horribly klunky for any sort of serious work - and, of course, opening SMB ports on your router is generally not a good idea. Before stumbling across this add-in, the only solution I found was to install an FTP server (!!!) and use the FTPdrive software on the client side. Which means managing shared folders/permissions in two separate places. I was getting close to just saying "to hell with it" and setting up some kind of VPN to allow remote access - pretty shoddy for something billed as a "home" server OS. Apparently the developers assumed that home users never travel or need proper access to their server from outside their LAN. A reminder to the spammer(s)... I get an email every time you post, so it's not too hard for me to remove your ads.